system and method; and this is true of acquiring proficiency in tarot reading. information except on its own vibratory plane. conditions for the psychic intelligence to manifest itself. arrangement by which accurate information may be conveyed through them. establishment of a relation of positive to negative between the client and the reader. downward, in the form of the spread he chose to use before the shuffling started. the common meaning, and is not to be restricted to it. of this astrological rulership to indicate the events which are to transpire. constellation picturing the sign are traced on the card as they appear in the sky. Course 10-1, Delineating The Horoscope. Aspect involving Mars in their birth-charts. complexion of the individual thus designated, if such is all that is required. sign, will reveal their spiritual possibilities. thoughts and plans are detrimental to the interests of the client. scepters correspond to the fiery signs. correspond to the watery signs. swords correspond to the earthy signs. coins correspond to the airy signs. correspondence of each card to a ten degree section of the zodiac. cycle, being summarized by the triplicity’s Key-word. with Cancer, the Airy triplicity with Libra and the earthy triplicity with Capricorn. other triplicities corresponding to the other suits. of the decanate to which it thus belongs. may be indicated in a tarot spread if the wide astrological interpretation is used. card right end up is more fortunate than it is when reversed. follows it in the spread. acquired only by much practice and observation of results. become useful to designate the various numerical relations. zodiacal signs to modify conditions. premises and conclusions on the same plane. desire would be known, meditate upon the union of Arcanum I with Arcanum VI. limited only by the capacity of understanding of the person using it. the ego. Natural remedy, light and color. Mineral, the metal gold. S–21, expresses in the spiritual world, angelhood. of thy will.In Divination, Arcanum XXI may be read as Success or Attainment. Arcanum XXI is figured by a kneeling young girl playing on a harp of three strings. through the wreath, sustained by two wings. experience on all planes, physical, astral and spiritual. These four emblems ranged around the zodiac typify the processes of evolution. usually rendered in occult circles as: “To Know, To Do, To Dare, To be Silent. three strings, for the union embraces all three planes. sublime vistas of the future. development of human functions and possibilities. perfection, union and attainment on all three planes, corresponds to the Sun. well corresponds to the ego. transmutation, and more specifically it denotes the completion of The Great Work. 50th, or gate of jubilee. 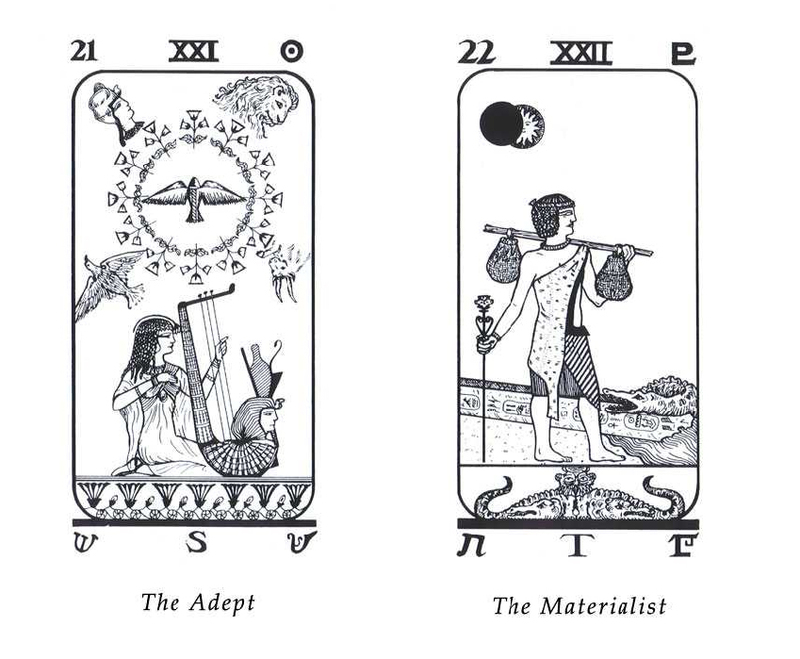 –In Magic, Arcanum XXI represents the exercise of the functions of adeptship. evolution, the topmost point in the ladder of worldly ambitions. on for far-reaching information not accessible in the outer world. Moses passed. And the 50th is that which relates to the union of true soul-mates. alleviate suffering and to aid the forward movement of universal progression. development of God’s Great Plan. premature, and leads many people to grievous error. consciousness developed, and with no special endeavor required. ladder to become the perfect man, or adept, corresponds to Arcanum XXI. black and the tone inharmony. In science it is either materialism or spirituality. of earth, or the element plutonium. T–22 expresses in the spiritual world, annihilation; 0 expresses eternal progression. furtherance of God’s Great Plan. thy folly unless thou immediately changeth thy ways. protecting others is so great that, though enlightened, he ignores all danger. The fallen obelisk symbolizes the final overthrow of all temporal work and power. also the persecution of those who work to spread the true facts of spirituality. there inevitably follows increased ability and real advancement. character to a higher basic spiritual, or vibratory, level. –In astrology it is found that the planet Pluto has two marked and opposite qualities. Great Work has been accomplished. Great Plan of eternal evolution. creative energies are devoted exclusively to material ends. endeavor to gain, through magic, material advantages over others. about it to attract obstacles to the performance of the thing resolved upon. it relates to spiritual attainment. one. 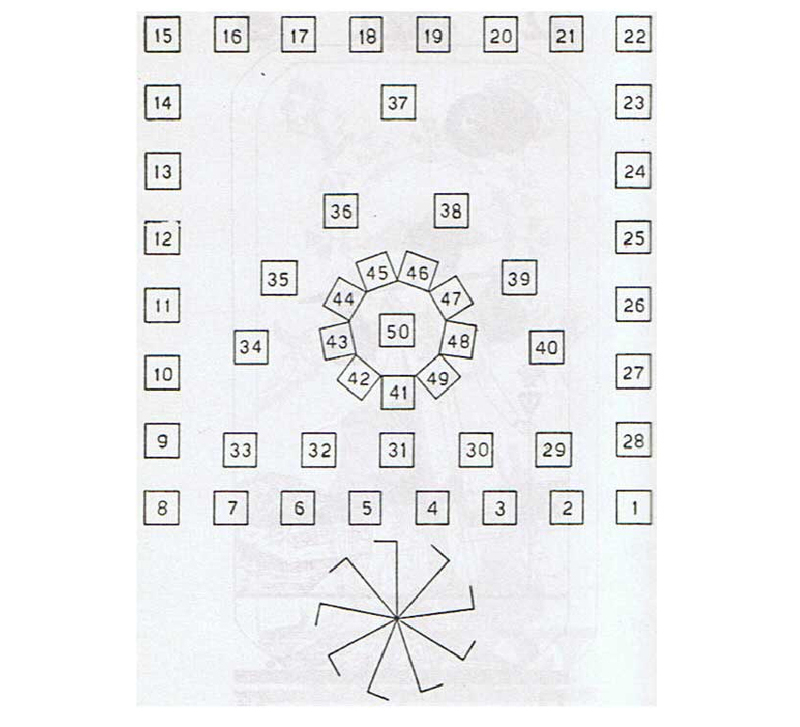 The spread is illustrated on page 232.
and such studies and opportunities as have to do with acquiring knowledge. considered as really important factors in the spiritual life. Jubilee, should be turned over and read.